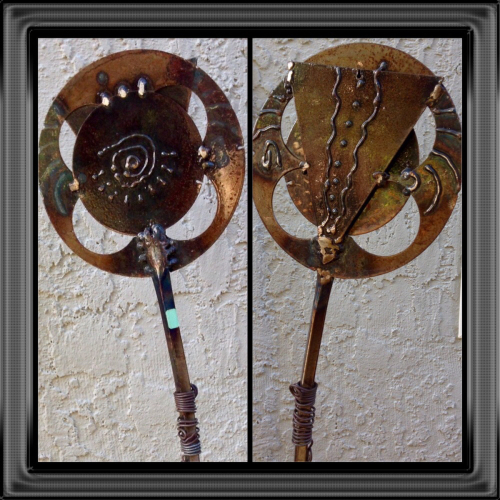 Infusing tribal colors with clay and recycled metal to create art and books for the soul. Dancing in the Wind is a kinetic sculpture which can be swiveled to reveal two very different sides. 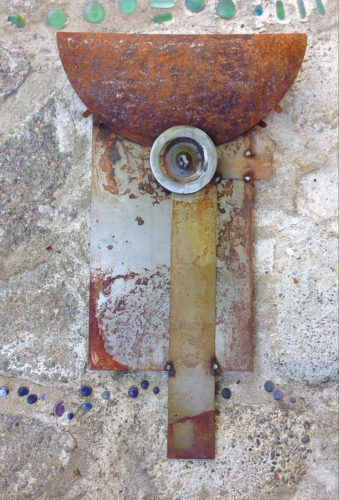 The recycled metal was partially acid-washed and colored with various oxides and natural rusting. The surface was powdercoated. This looks fabulous at sunset with the sun glinting off the steel. Shipping and handling charges are additional. 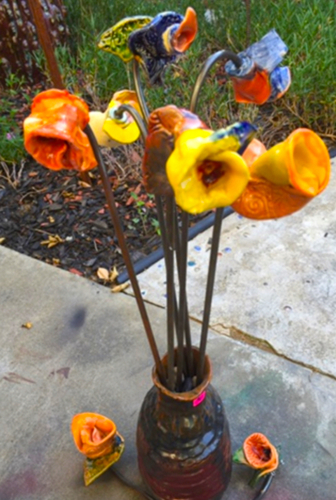 No watering needed to keep these colorful ceramic flowers beautiful all the time! 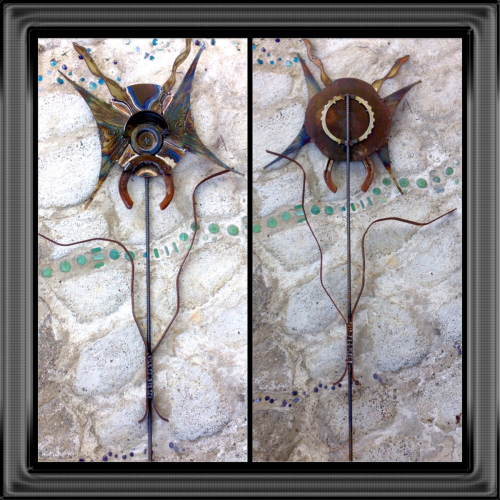 Each hand-sculpted ceramic flower is mounted onto steel or aluminum rods (the aluminum may be bent into different shapes). They may be arranged in a vase or used outside in the garden for a bit of color all year long. $30 each. 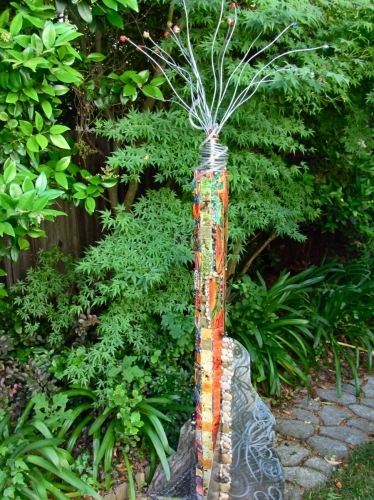 Kanika welds her garden stakes from recycled steel and colors them with a propane torch, spray paint, solvent oxides, or acrylic paints. Some are powder-coated, or sprayed with a clear spray sealant; the latter should be applied every 6 months to maintain the color. Some pieces are left to rust naturally. Just pop these one-of-a-kind beauties into the ground for a stunning burst of color. NOTE: Additional shipping and handling charges may be necessary due to the size of the sculpture. Imagine standing underneath this "tree" of clay tiles, faces, glass baubles and other interesting objects, looking up into the aluminum branches that are topped by glass-like "wishes" or goals? It means your dreams and wishes can come down from the light above, through you, who is represented by the tree. Shipping and handling charges are additional. Kanika uses recycled metal, with all its aged beauty, to weld new sculptures, most of which may be displayed outdoors or indoors. This piece may be hung on a wall inside or on a fence or outside wall. It will continue towards rusting unless it is sprayed every 6 months with a clear sealant. Bodies in Motion represents the beauty of the Black Woman, as celebrated in Maya Angelous poem Phenomenal Woman from her 1978 work "And Still I Rise." Colorful women are painted on clay tiles that are affixed to specially-aged steel strips. The strength of the steel tower is tempered by sensual rivers of silver and gold running lengthwise through each side. This look was achieved by specially rusting 4x48 metal strips, running an angle-iron grinder along the length of each strip, then welding those strips to metal rods in the corners. The low-fire tiles are painted using various glazes which portray WILD women, STRONG women, BIG-HIPPED women, GRACEFUL women, BIG-HAIRED women, FULL-LIPPED women, PROUD women, PHENOMENAL women. This is one of my favorite poems of all time and Maya Angelou is one of the most incredible women I know. Shipping and handling charges are additional; contact Kanika about the specific charges for this piece. This is the fifth in a series of lighted out door art works. The core is vinyl with hand painted tile and glass mosaic on the surface. 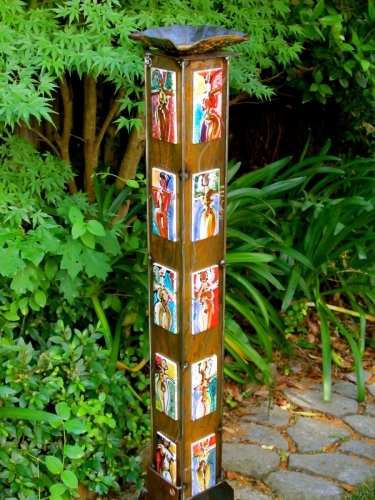 The mosaic column is mounted on a welded steel base. Rope lights wind through the interior and exterior of the sculpture, producing gentle colored light from the inside out. NOTE: there will be additional shipping and handling charges due to the size and weight of this piece If it is not picked up from Kanika's studio. Rebar and recycled steel is welded together and colored with various oxides and covered with resin. The sculpture sways in the wind on its strong concave base. One side of the sculpture has transparent pink/red tones, the other is silver. Shipping and handling charges are additional. 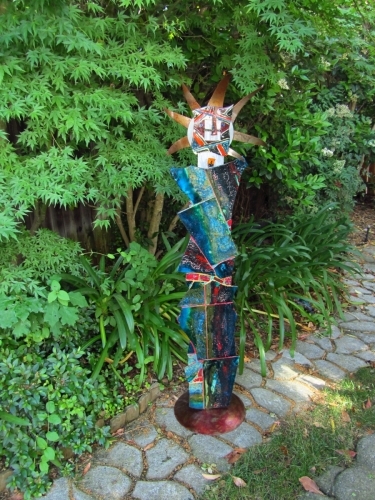 This fun-loving Clay totem is stacked on a welded steel base, topped with the sun face. Each piece in the totem maybe rearranged, if desired. NOTE: there will be additional shipping and handling charges if the totem is not picked up from Kanika's studio. Square steel rods are welded to a steel base to simulate a willowy plant. Painted bright red, this sculptures is particularly striking in front of deep green plants. The base can hold a planter, if desired. NOTE: Due to the size there will be additional shipping and handling fees if the sculpture is not picked up from Kanika's studio. Circles of Life ____. Rebar and recycled steel is welded together and colored with various oxides and covered with resin. The sculpture sways in the wind on its strong concave base. Shipping and handling charges are additional. 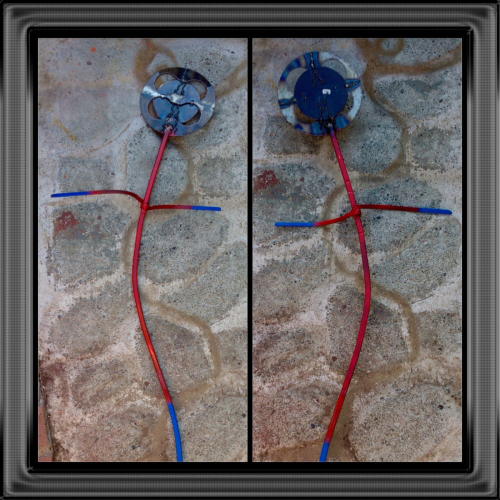 One of two similar tile sculptures, "Vernal Coupling" presents one of Kanika's first explorations into using recycled metal with cracked tiles mounted on OSB wood prepared with wood preservative for covered outdoor use. Wall-mounting this piece (without a stand) is $100 less. Shipping and handling charges are additional. 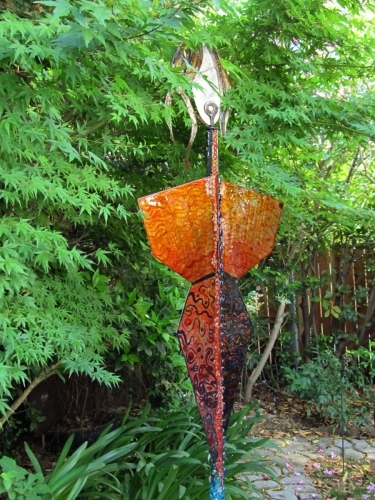 Kanika used a plasma cutter and welder to develop an exciting kinetic sculpture for the garden. She used several different grinders on the recycled steel body to impart designs that shine in the sunlight. The body turns on its rebar axis and dances and turns in the wind. The back spine of the kinetic sculpture is studded with colorful glass and clay which sparkles in the sun. Shipping and handling charges are additional. This organic clay vessel may be used as a fountain or just placed into the garden. There is an opening in the bottom large enough to insert a small fountain pump. This is best placed in a pond or large bowl of water. NOTE: there may be additional shipping and handling charges if the sculpture is not picked up from Kanika's studio. This 7.5" clay tile, glass, and steel totem has windowed cutouts and small potholes throughout the totem to allow rope lights to shine through day or night. Shipping and handling charges are additional. This hand-built clay and glass sculpture contains a small pump in the base. Water gently flows down from the top down the sides. It may be placed in a small pond or deep bowl. Kinetic Couture was initially based on the glamour and sophistication of the singer, actress and spokesperson, Diahann Carroll. The sharp angles in the powder-coated steel body depict the strength of this Diva. The grinding marks and glass buttons add sparkle and flash, like the jewel that she is. The sculpture may be displayed indoors or outdoors where she will move and dance in the wind. Shipping and handling are additional charges; contact Kanika about the specific charges for this piece. 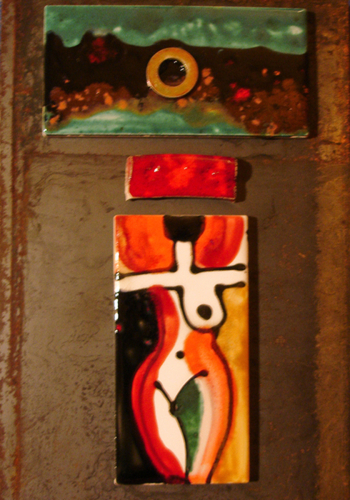 Clay tiles with colorful breast cancer survivor woman on recycled steel. For inside or outside use. Coil and slab techniques were used to create this interesting ceramic goddess fountain. The water spills out over the top of its neck opening. Because of its size it is recommended that this fountain be placed in a pond. It comes with a pump. NOTE: because of its size, there will be additional shipping and handling charges if it is not picked up from the studio.